57Fe emission Mössbauer spectroscopy has been applied to study the lattice location and properties of Fe in gadolinium gallium garnet Gd3Ga5 O 12 (GGG) single crystals in the temperature interval 300 – 563 K within the extremely dilute (<10−4 at.%) regime following the implantation of57Mn (T 1 / 2= 1.5 min.) at ISOLDE/CERN. 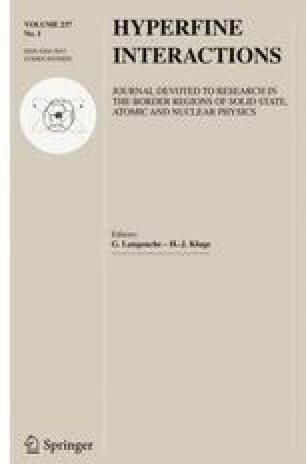 These results are compared with earlier Mössbauer spectroscopy study of Fe-doped gadolinium gallium garnet Gd3Ga5 O 12(GGG), with implantation fluences between 8×1015 and 6×1016 atoms cm−2. Three Fe components are observed in the emission Mössbauer spectra: (i) high spin Fe2+ located at damage sites due to the implantation process, (ii) high spin Fe3+ at substitutional tetrahedral Ga sites, and (iii) interstitial Fe, probably due to the recoil imparted on the daughter57∗Fe nucleus in the β − decay of57Mn. In contrast to high fluence57Fe implantation studies the Fe3+ ions are found to prefer the tetrahedral Ga site over the octahedral Ga site. No annealing stages are evident in the temperature range investigated. Despite the very low concentration, high-spin Fe3+ shows fast spin relaxation, presumably due to an indirect interaction between nearby gadolinium atoms.